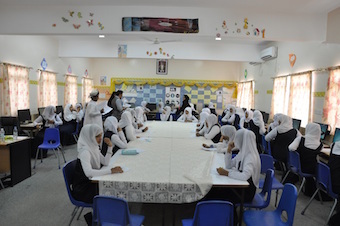 The Local Community Development Committee at Duqm inaugurates today (Monday 27 October 2014) the English Language Teaching Program, which it implements for school students and employees working at Duqm and being carried out in cooperation with the Ministry of Education, Oman Drydock Company and Occidental Petroleum Corporation. The morning sessions of the program target around (140) students in the eleventh and twelfth grade in the Arabian Sea School and Duqm Primary Education School. The program includes in its evening session about (80) employees who work in Duqm. Ismail bin Ahmed Al-Balushi, the Deputy CEO at SEZAD and the Chairman of the Local Community Development Committee, said that the program which, will last for (6) weeks, aims to develop the skills of school students in learning the English Language and it was designed in order to aid students in raising their academic achievements, especially that the program is carried out by teachers who are native English speakers and have solid experience in this field. In addition, the program targets employees working in Duqm that expressed their interests to learn the English Language and to enhance their lingual abilities. Al-Balushi added in a press release that the Local Community Development Committee endeavors through this program to keep pace with the needs of students and employees working in Duqm concerning learning the English language. As there are, in the meantime, no institutes to teach the English Language in Wilayat Duqm, the committee sought in cooperation with Occidental Petroleum Corporation and Polyglot to implement this program that was designed to meet the needs of students and employees at SEZAD. He pointed out that the English Language Teaching Program is one of the programs embraced by the committee within an array of similar programs, indicating that the committee will evaluate in the coming period the outcome of the program to expand it to include bigger numbers in the future. The Deputy CEO noted what programs the committee has completed since it was formed last December, and said that the committee has carried out, this year, a number of programs including the provision of (10) scholarships allocated to the youth of Wilayat Duqm in a number of specialties. The committee, currently, is setting up a project to build a School for the memorization of the Holy Quran at Duqm, to build shades in a number of schools and to build fully serviced rooms for individuals with special needs and several other projects. The committee consists of (12) members (6) members represent government institutions operating at SEZD and (6) members represent the local community.